Happy February! The month of love, romance, and chocolate hearts is upon us. What better time to share all the wonderful benefits of everyone's favorite romantic flower, the lovely Rose. Known the world over for love and romance, the Rose is an amazing herb for all matters of the heart. Even Shakespeare wrote of it's power in love, but the Rose's fame goes back much further than the Bard's time. In ancient Egypt, the rose was sacred to the goddess Isis. In ancient Greece and Rome, it was sacred to Aphrodite and Venus. Romans also scattered rose petals along the routes of funerals, both for protection and to symbolize rebirth. In both Islam and Sufism, the rose symbolizes divine love and was often depicted in art, architecture, and used in landscapes. In the Medieval era, Christians attributed the rose to both Christ and the blood of martyrs. Catholics later used the rose for the Virgin Mary and used rose petals to make the beads for what would later be called the rosary. In China, red roses had a special place because red was an auspicious color, so red roses symbolized luck, love, and fortune. Even Native Americans were well acquainted with this plant and it's uses. There are over 100 species of Rose with thousands of cultivars. Generally speaking, a rose is a woody plant in the genus Rosa, within the family Rosaceae. Roses can be shrubs, or they can be climbing or trailing like vines, with stems that are often armed with sharp prickles that we typically refer to as thorns. Flowers vary in size, color, and shape. The fruit is a berry-like structure called a rose hip. The Rosa gallica (Provence Rose), R. eglanteria (Eglantine Rose) and R. damascene (Damask Rose) are the three oldest roses in cultivation. Most species are native to Asia, with smaller numbers native to Europe, North America, and northwestern Africa. Persia is considered the likely origin of the flower. In addition to the famous flower, roses have a great fruit that is not only delicious, but also full of medicinal properties all on it's own. Rose hips are full of vitamin C, and taste a bit citrus-y because of it. These berry-like fruit make a great jam, are delicious when added to salads, and super versatile in the kitchen. Try re-hydrating the dry hips and adding them into your favorite muffin recipe, or using them to flavor your favorite poultry dish. 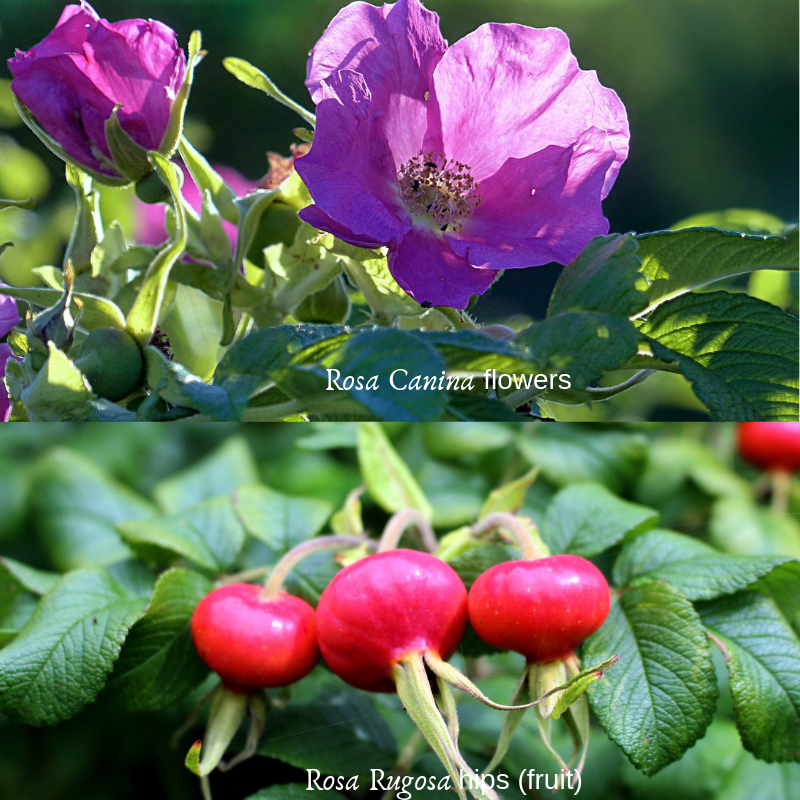 Check out the Montana Homesteader's tips on foraging for rose hips and recipes, there's bound to be several you'll fall in love with. Summary of Actions- Anticancer, Antidepressant, Antiscorbutic, Antispasmodic, Aphrodisiac, Aromatic, Astringent, Coagulant/Hemostatic, Cordial, Depurative, Emmenagogue, Hepatic, Laxative, Nervine, Refrigerant, Sedative, Skin tonic, Stomachic, and Uterine Tonic. Traditional Chinese Medicine (TCM)- Mei Gui Hua (Rose) is used for the heart, liver, spleen, and stomach meridians. Used as a decongestant and astringent, rose is considered to have a draining action that clears heat and cools. It moves Qi, dispersing stagnation, particularly that of liver Qi. It aids in the case of constipation, headache, nausea, belching, and poor appetite. It clears heat and calms the heart, helping clear up fertility issues and depression. It also harmonizes the blood, easing many menses-related problems and helping promote urination. Ayurveda- Known in Sanskrit as Satapatri and in Hindi as Gulab ka phool, which translates roughly as 100 petals. In Ayurveda, rose has three main healing attributes; it is soothing, cooling, and moisturizing. But it is most valued because of it's balancing effect on the heart, both physically and emotionally. Native American Traditions- Each of the Native American tribes had a use for roses. The Omahas and Chippewa used the roots and hips to treat eye infections and inflammation in the eyes. The Chippewa also used rose hips as a staple food. The Arapahos used the seeds to treat muscle pain. Cheyenne and Flathead both used the petal, stem, and roots to treat snow blindness, but the Cheyenne also made a tea from the bark to treat upset stomach and diarrhea. The Crows boiled the roots and used the vapor to stop mouth and nose bleeds. They also used the roots in a hot compress to treat inflammation. Essential Oil- Rose Essential Oil is one of the most expensive on the market, and deservedly so since it takes over 1,000 rose flowers to produce ¼ oz of the oil. However, if you can afford it, diffusing the rose essential oil is a great way to relieve insomnia, reduce nervous tension, and help to lower your blood pressure. Stress and Anxiety- Rose is packed full of comforting qualities and helps to soothe nerves and anxieties. It may not completely alleviate the impact of stress and anxiety for those with severe problems, but it may help reduce them and can be very beneficial in the long term. Comfort for the Grieving- Rose balances the emotions of the heart, helping to comfort those who are grieving. Cool Off- Rose helps to regulate the body temperature during the warmer months. Allergies, Seasonal Stress, and Illness- Rose tea (petals and/or hips) helps soothe sore throats, and it's packed full of vitamin C to help boost the immune system and knock out that cold. Hair, Acne, and Skincare- Rose water is one of my favorite face washes/make up removers. Not only does it work to clean your skin, while still being gentle enough to use around your eyes, but it's also super anti-inflammatory, antibacterial, and astringent so it's great to help prevent and treat acne. Rose also helps to lock in the moisture in the skin and reduce the appearance of fine lines and wrinkles. It's also been shown to help reduce the appearance of spider veins. Rose has also been studied recently for it's effect on Scalp Seborrheic Dermatitis. The findings, thus far, have been very positive. Wounds- A powder from the petals and dried leaves has been traditionally used to help speed the healing of wounds. In some cultures, the petals were even used to pack surgical wounds to help prevent infection. Digestion- Rose petals and hips help to stimulate the body's bile production, which greatly aids digestion, particularly the digestion of fats. It also helps to balance the gut's microbiome, helping to keep the bad bacteria and yeasts in check, while boosting the effectiveness of the good bacteria and yeast cultures. It's also a mild laxative and makes a great, gentile, tea for constipation. Healthy Heart- Rose helps to lower blood pressure and is packed full of helpful antioxidants that help keep the circulatory system healthy. 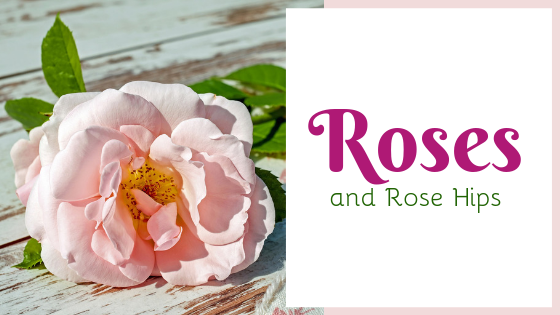 Great for All Feminine Needs- Traditionally, rose tea has been consumed to help ease menstrual cramps and regulate periods, but it's also great for so many other feminine concerns. Rose tea has been shown to help ease the symptoms of PMS in certain women and it's also traditionally taken during labor to help aid in childbirth. Contraindications and Warnings- Rose is generally considered to be safe and no adverse side effects have been reported. Despite its safety, some experts warn that you should limit the amount you drink to a maximum of 5 cups per day because consuming too much vitamin C can have certain adverse effects, such as diarrhea. Drinking too much rose tea could potentially cause dizziness, nausea, vomiting, diarrhea or headaches. I only included a basic introduction to this beautiful plant. I hope you have learned a new appreciation roses, beyond that of their unparalleled beauty. If you have any questions or comments, please leave them below.